The British LGBT Awards honoured some of the world’s top stars last night, including Sir Ian McKellen, Sam Smith and Boy George. OutNews Global streamed the ceremony and interviews live with great interaction from those that couldn’t attend the sold out event. A range of gay stars and ‘straight allies’ were recognised for going the extra mile to ensure equality, opportunity and fair treatment for all, regardless of sexuality at London’s Grand Connaught Rooms, with the evening hosted by Mel B and Duncan James. 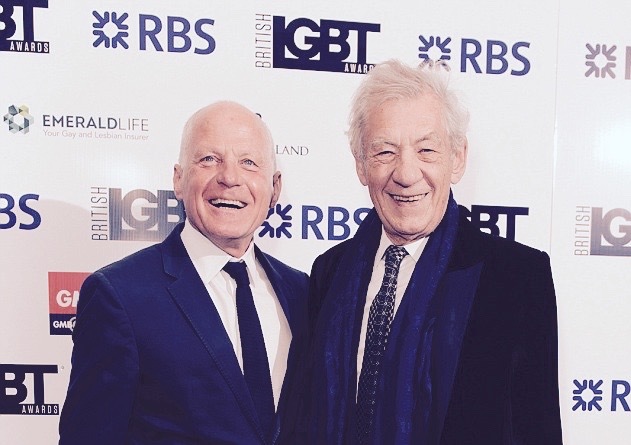 Stage and screen veteran McKellen was handed the prestigious Global Icon Award for his decades of activism on behalf of the LGBT community. Congratulating all winners, former Spice Girl Mel said: “Every winner and every nominee is incredibly deserving. You are the cool kids and I am proud to be with you celebrating your success with you. Other winners included, Queen legend Brian May who was given the Straight Ally of the Year accolade. Chatty Man star Alan Carr picked up the LGBT Celebrity of the Year gong, while BBC Two show Boy Meets Girl won Media Moment of the Year. Newsnight’s Evan Davis was named as Broadcaster of the Year, Olympic boxer Nicola Adams – Sports Personality and Sam Smith as Music Artist of the Year. Some of the UK’s top business leaders, charities and organisations were also recognised for their commitment to the LGBT community. To watch the streaming of the awards please visit our Facebook page.